The Coldwater Coal Company from American Model Builders is typical of small community material yards. These small businesses were where customers could purchase coal for home heating as well as gravel and sand. 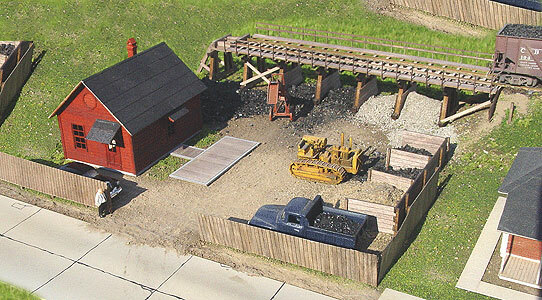 This laser-cut wood kit includes a 24' x 18' yard office with truck scale, several material bins, 120 scale feet of wood fencing, and a coal trestle based on a Pennsylvania Railroad prototype. Like other LASERkit models, the model features peel-and-stick windows and doors, rolled roofing and white metal parts as appropriate. The trestle includes 12 bents, Micro engineering Code 70 rail and laser-cut wood ties. The model can be arranged to fit available space; as shown it measures about 12" x 12". Copy this Coldwater Coal Company to your MY ACCESSORIES roster. See more products from American Model Builders, Inc.